Brian de Vallance is Chief Operating Officer of Cambridge Global Advisors. Previously, he served as the Vice President of Policy & Outreach for the Center for Internet Security, Inc. (CIS), home of the Multi-State Information Sharing and Analysis Center and the CIS Critical Security Controls. CIS operates as a nonprofit entity to advance cybersecurity readiness and response for public and private sector enterprises. Brian was responsible for monitoring and coordinating CIS’s contributions to American cybersecurity policy at all levels of government including the U.S. Congress, the White House, and key state and local government associations. 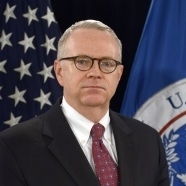 Before his time at Cambridge Global, Mr. de Vallance served as Assistant Secretary for Legislative Affairs at the U.S. Department of Homeland Security (DHS). In this position, Brian de Vallance acted as the DHS’s principal liaison with the U.S. Congress, coordinating and overseeing the Department’s legislative activity; working closely with authorization, appropriations, and oversight committees of the House and Senate to ensure that the Department’s priorities were reflected throughout the legislative and oversight process; and advising the Secretary, Deputy Secretary, and other senior leadership of the Department on legislative matters. Mr. de Vallance served as the Department’s Acting Assistant Secretary for Legislative Affairs from May 2013 to August 2014. Prior to that, he served as Senior Counselor to then-Secretary Janet Napolitano and Chief of Staff to then-Deputy Secretary Jane Holl Lute. In addition, he served as the Department’s senior accountable officer for the implementation of the American Reinvestment and Recovery Act, and worked on issues relating to integration of public safety among the Federal departments and between the Federal and state, local, and tribal governments. De Vallance also worked extensively on immigration and border issues. Previously, Mr. de Vallance served on the senior staff of two governors, a mayor, a state Supreme Court chief justice, and U.S. Attorney General Janet Reno, where he served as the U.S. Department of Justice’s Director of Intergovernmental Affairs and its Federalism officer. He graduated from Brown University and Arizona State University’s College of Law, where he served as the editor-in-chief of the law journal.